In 2017 CEFCO raised $48,611 through POS balloon campaigns at their gas stations. 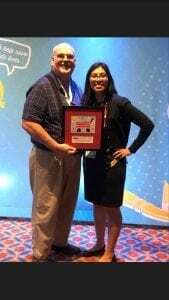 Jim Wratten, a district manager who oversees six stores in the Dallas market, raised the most money in his district for Children’s Miracle Network. Jim won a trip for him and a guest to Children’s Hospitals Week. In March of 2018, Jim was honored with Kids framed artwork in Coronado Springs, Florida, for his accomplishments for CMN. Thank you Jim for all your hard work! CEFCO has been a partner with Children’s Miracle Network hospitals since 1999. We are very grateful to CEFCO and we look forward to strengthening our partnership through the upcoming fundraising events.